The Hausmann hamper is a durable function hamper stand that has a fold down lid and opens with the hands-free metal foot pedal. It accommodates 36 to 42 gallon bags. Plated steel frame accommodates 36 to 42 gallon bags (not included). 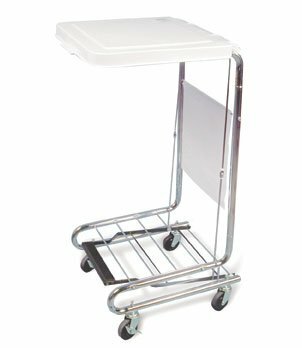 "Hands-free" metal Foot Pedal raises the white, poly-coated steel hamper lid. MODEL #2189 WIDTH 18" DEPTH 19½" HEIGHT 38"